Don't damp mop: Water and wood floors don't mix! Use only the manufacturer's recommended cleaning products on your hardwood floor. Vacuum regularly: Small stones, mud and gritty dirt tracked in from outside can play havoc on the wood floors finish. To help combat this use long bristle welcome mats placed at all outside entrances for people to wipe their feet on before entering onto the floors. Also, vacuum using a soft bristle brush attachment. Use the proper chair glides: Narrow wheels, sharp wooden legs or metal furniture legs can scratch and dent hardwood floors. Any furniture that rests directly on top of a hardwood floor should have felt protectors, or furniture coasters under all its feet. For extremely heavy objects such as a piano, use wide, non-staining rubber cups. Purchasing floor protectors is cheap insurance for protecting your hardwood floor investment. Protect from direct sunlight: your wood floor may change color or fade due to exposure to direct sunlight. The sun's UV rays accelerates the oxidation and aging of wood so periodically rearranging your furniture and closing the curtains during intense periods of sunlight can help avoid the problem. Don't use oil soaps: There are many over the counter oil-based soaps and wax based cleaning products that may damage or dull the finish of your wood floor. The best suggestion is to only use the manufacturers recommended cleaning products on your hardwood flooring. 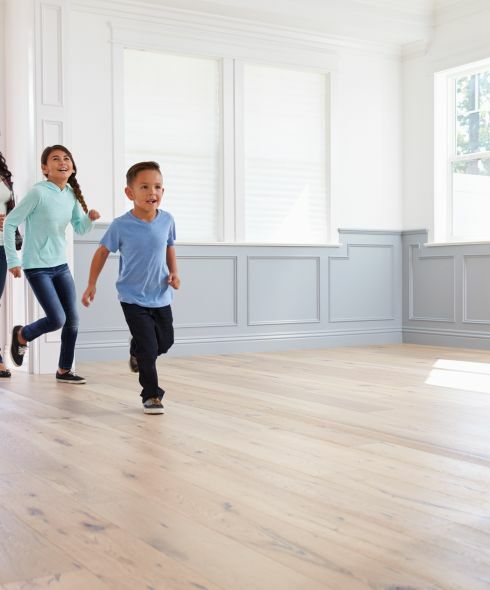 Never wax a urethane wood finish: If your hardwood floor has a polyurethane finish never use a paste wax on the floor's surface. A paste wax may form a sticky film on your floor and allow tracked in dirt to stick to your wood finish. Polyurethane finishes will not adhere to any wax and adding a fresh coat of polyurethane to your floor will be very difficult. Trim pet's claws: Pet's claws may scratch you floors finish. Regularly trim dog's claws to help reduce scratching your floor's finish. Wipe spills immediately: when accidents happen and some liquid gets spilled on your hardwood floor, you should use a slightly damp white cloth, or paper towel to immediately clean up and dry the effected area. For more difficult spots, follow the manufacturer's recommended cleaning procedures.